Click the Properties tool button ( ) on the Standard toolbar. The pressed state of the tool button indicates that the Properties panel is currently open. Click the tool button again to close the Properties panel. Right click when the cursor is on a toolbar. The marked items in the context menu are currently open. The Properties panel opens, showing the properties of the selected entity. Double clicking entities such as texts, blocks or polylines start an editing command (See the Mouse tab on the Customize dialog). Choose Properties in the Modify menu. Type properties in the command window, then press Enter. The Properties panel is dockable panel. To dock the Properties panel, drag it by its title bar to either the left or right hand side of the BricsCAD application window or onto another dockable panel. Read-only fields display in grey. The content of a read-only field can be copied though. To copy a read-only field, click the field, then press Ctrl C.
1. 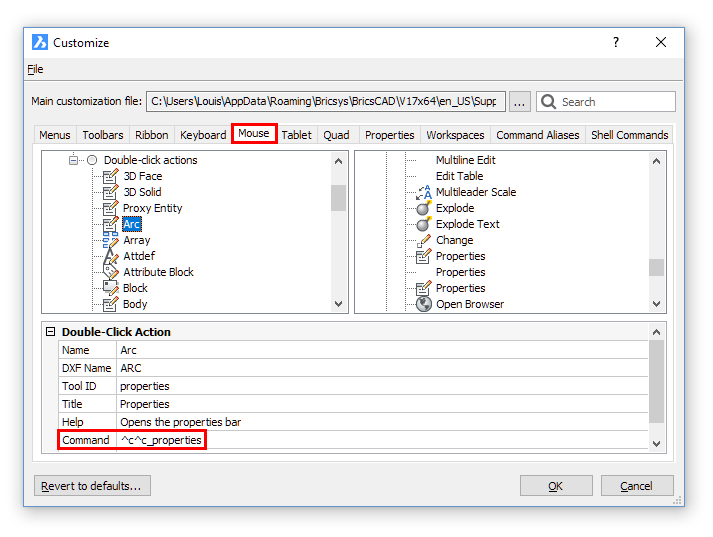 Move the cursor over one of the edges of the Properties (1). The cursor turns into a double-headed arrow. 2. Press and hold the left mouse button to drag the edge of the Properties . 3. 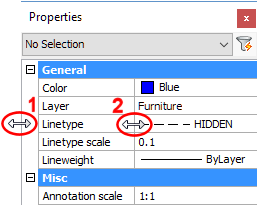 Move the cursor over the boundary between the Setting Names and the Setting Fields columns (2). 4. Press and hold the left mouse button to drag the boundary. When docked, only the left (or right) edge of the Properties is adjustable. then click the down arrow button to select a color. then click the down arrow to select a layer. (option) Click on Linetype . then click on the down arrow to select a linetype. 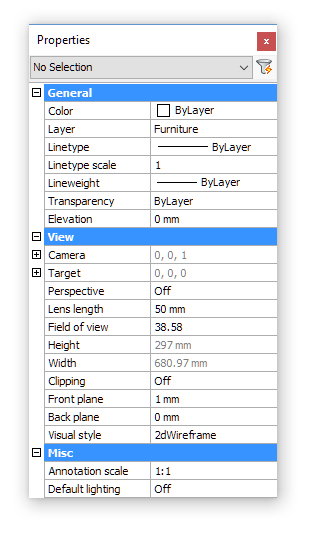 then type the new value in the Linetype scale field. then click on the down arrow to select a lineweight. The entity's properties display in the Properties panel..
Click the property you want to modify. The settings field of the selected property is activated. Type a new value in the settings field of the selected property or choose a setting from the list box, then press the Enter key or select another property. (option) repeat steps 2 and 3 to modify another property. Press the Escape key to stop. Properties of which the value displays in grey cannot be modified. Step 3: Properties (such as the General properties), which are chosen from a list are updated instantly. Select the X-, Y- or Z- field, then enter a value. Select either Start point or End point. An X indicates the point being edited. Click the Pick Point button ( ). Specify the point in the drawing. 3. Press the Escape key to stop. On the Properties Bar under Geometry , select Vertex . Click the Next/Previous arrow buttons to select a vertex. An X indicates the vertex being edited. Select the X- or Y- field, then enter a value. Under Vertex select Position and click the Pick Point button ( ), then specify the point in the drawing. 5. Press the Escape key to stop. The shared properties display in the Properties Bar . Type a new value in settings field of the selected property or choose a setting from the list box, then press the Enter key or select another property. All selected entities are updated simultaneously. *Varies* displays for shared properties which are defined differently. If you edit such property, all entities in the selection set will be equally defined for this property.